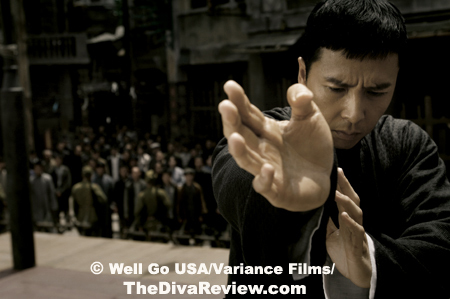 My adoration of Hong Kong action star Donnie Yen is a well-established subject on this site. 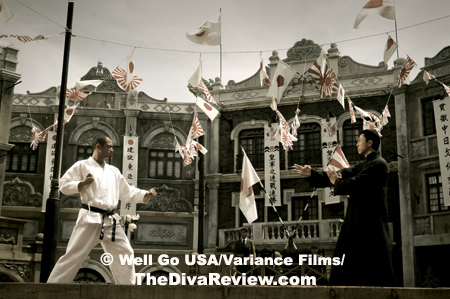 Bearing the standard of the martial arts movie genre in this century with films like 2005’s Sha Po Lang and 2007’s Flash Point, Yen seemed to have picked up the mantle left by Jet Li’s frequent retirements, Thailand’s Tony Jaa’s erratic career whims and Jackie Chan’s endless and unfortunate pursuit of American fame. Stanning for Yen though I have, I must admit some uneasiness when I heard he was going to star in a biography of the same subject as the next opus by legendary Hong Kong director and art house fave, Wong Kar-wai. How could the two films compete? 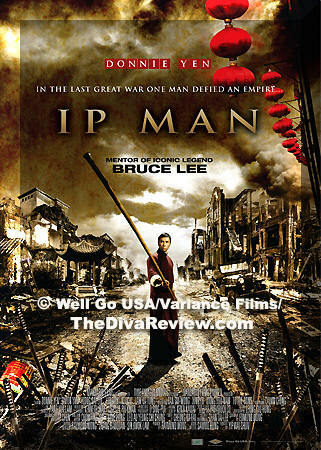 Luckily, time and director Wong’s equally-legendary slowness were on Yen’s side and his film, Ip Man was released first. The story of the Chinese martial arts teacher who is perhaps best known for his most famous student, Bruce Lee, is one that certainly merits a few tellings. Director Wilson Yip traces the life of Ip from his days as a young husband and father in the Foshan district to his transformation into a teacher of the Wing Chun art form he excelled at. Opening in 1935, when Foshan was the martial arts capital of China; for all the schools stacked side-by side teaching different disciplines, everyone knows that the greatest fighter in town, Ip Man, takes no students. This fact doesn’t stop Ip from being challenged frequently by up and comers who must prove their worth in the fight-happy city. To his lovely wife’s housekeeping dismay, Ip is a study in graciousness and will always give a challenger a chance to test their skills, however meager against his own. It is this kindness that has made Ip a favourite in his town not only for his fighting expertise, but for his generosity in both manners and finances. 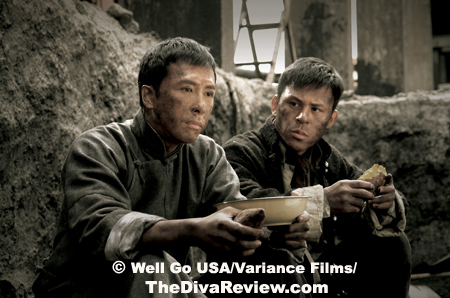 When the Japanese occupy Foshan in 1937, the privileged Ip, who hailed from a background of education and wealth, must now live in a hovel after his estate is seized for use by the invaders as their headquarters. Now toiling for the survival of his family in the coal mines, Ip is one of the few granted work due to the esteem the townspeople hold him in. Sadly, for the Japanese there’s not enough entertainment in Foshan, so they devise their own using the martial arts center’s best fighters to challenge their own soldiers. When Ip discovers that the winners of these closed-door tournaments might receive a bullet to go with their promised victory bag of rice, it is the one time the calm, collected master loses his cool, showing the invaders the sick man of Asia isn’t quite on its last legs. Having humiliated the occupiers, the need to defeat the Chinese man for the sake of the face of the Japanese military puts the Ip family in danger. 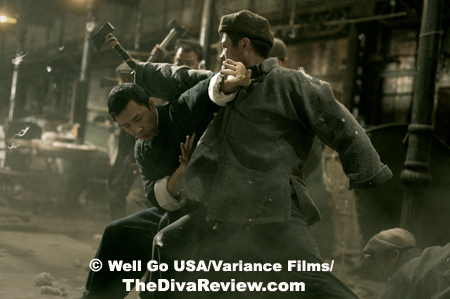 Yes, it’s a kung fu film, very much so, with some of the most stunning hand-to-hand combat filmed in recent years (Choreographed by kung fu icon Sammo Hung). 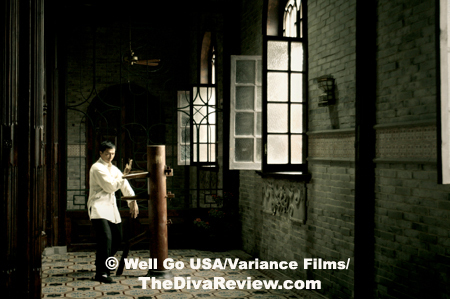 The first fight, Ip’s sparring match with another master is genial and a study in good sportsmanship, but introduces us quickly to the graceful, yet deceptive elegance that hides the power behind the Wing Chun style. One wonderful example of the clever staging -- Ip’s fight with a Southern tough come to Foshan to establish himself -- will change the audience’s perception of feather dusters for all eternity. Once the gentility is gone and Ip fights for the honour of brutalized friends in the Japanese dojo, his battle against ten karate students captures the flow and strength of Wing Chun beautifully, with Ip’s rolling, lightning-fast series of punches not just blinding in their speed but also in their damage. With all this chop socky goodness, it would almost be excusable if the more dramatic functions of the film were lacking, but they’re not. Ip Man, as played by Donnie Yen follows a clear journey, from well-heeled gentleman of leisure, to hard working coolie in a coal mine, to sudden and reluctant political activist protecting his family and neighbours from the Japanese cruelties and homegrown wartime bandits. Besides Yen’s capture of Ip’s passage from slightly absented-minded man of wealth to clear-eyed survivor, Ip Man’s supporting cast is equally good; including Simon Yam as Ip’s closest friend and stalwart business partner and Lynn Hung, who steals her scenes as Ip’s concerned, loving wife. Mrs. Ip disapproves of her husband’s fighting, encouraging him instead to be a good dad and spend less time with the Wooden Man and more with their little boy. Hung’s every arch, sidelong glance could freeze black belts in mid-kiai any day. 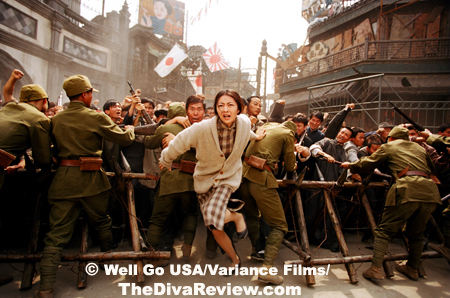 The cinematography and production design of China’s relatively carefree days shortly before the Japanese invasion are represented in bright, bursting colours while post-invasion Foshan shows crumbling, dilapidated buildings bathed in light sepia or very washed-out hues while Japanese planes loom overhead. Ip’s life was a very filmworthy project and trying to capture it all would be a daunting task for any director, so occasional lapses in momentum or unnecessary mawkishness like Ip’s training of the factory workers are forgivable and still entertaining. The obvious effort and care taken with this production is evident and pays off. Not only is it one of the most entertaining and exciting movies out of Hong Kong for many years; Ip Man is a bona fide martial arts classic. Click Here for our Exclusive Interview with Ip Man Fight Choreographer and Hong Kong Action Legend, Sammo Hung. Click Here for our Exclusive Interview with Award-Winning Hong Kong Actor & Ip Man co-star, Simon Yam. 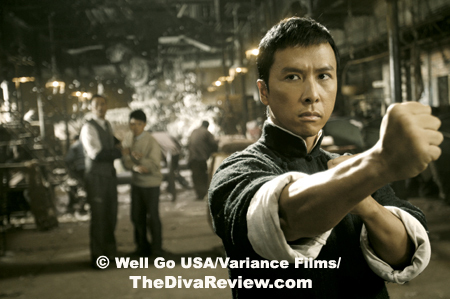 Click Here for our Review of Donnie Yen's Flash Point. Click Here for our Exclusive Interview with legendary Hong Kong Director of the upcoming film The Grandmaster - also based on the life of Ip Man, Wong Kar-wai.